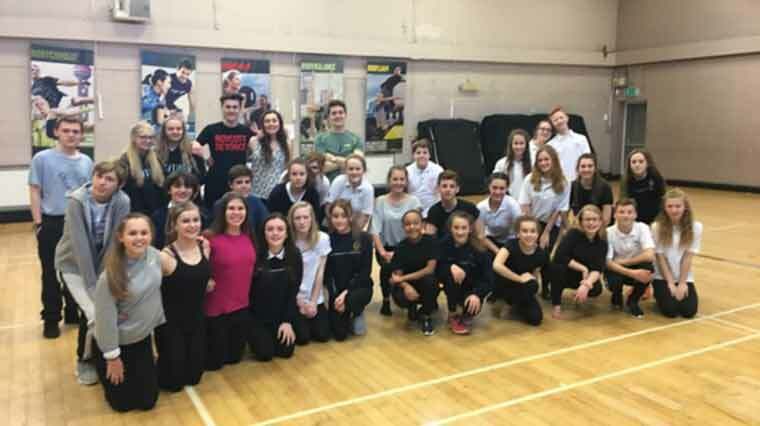 On Thursday 26 January, students at Queen Elizabeth’s School, Wimborne, were visited by local West End performer, Dan Partridge, who has just finished a year-long run in Mamma Mia at the Novello Theatre, London and is about to appear in a European Production of Starlight Express. Dan held three workshops in dance, acting and musical theatre. Students were taught a highly complex dance routine, giving them an insight into the professional working world and the demands that would be put upon them. Dan also taught students the end routine from Mamma Mia, in which students learn the vocals, harmonies and dance of the finale number. This was a valuable and unforgettable experience for all students involved. Dan imparted his professional knowledge and was an inspiration to students who are considering a career in the performing arts. Students from Queen Elizabeth’s specialist in-house creative academy HYPE were thrilled, “It was great to be able to speak directly to a real professional, as well as being taught the routines they use in the West End”; “Dan was really inspirational and I learnt a lot about the working world of acting and musical theatre”, said two of the pupils afterwards. HYPE looks forward to working with Dan on future projects.